George Smiley is once again retired from The Circus, living peacefully in his Bywater Street home. But a letter from Paris sets in motion a chain of events that, once again, calls George back into the game. If a rogue elephant... charges at me out of the thicket of my past and gives me a second shot at it, I intend to shoot it dead—but with the minimum of force. These posts will follow the original BBC cut of this show, which breaks the series up into 6 episodes each about 1 hour long. The Region 1 DVDs (PBS version) feature a different, shorter cut, so if you happen to notice at some point that Villem isn't in the version you're watching just be aware that we're following a slightly different version of the show and you might be missing quite a bit of back-story. I remember watching this when it first aired in 1982, and being confused at first by the seemingly disparate threads in the plot. Despite having some vague recollections of how things came to fit together, I wasn’t much less confused on a second viewing (33 years later!) Even so, it drew me in like nothing I’ve watched for years. One thing I found hard to gauge was the timescale of the initial events - I was left wondering how long did it take for the ‘Magician’ to visit Ostrakova after the General had received her letter, for example. Some unconnected observations: (i) Dudley Sutton as Kirov was struggling with that accent; (ii) Michael Elphick’s detective seemed almost implausibly competent, helpful and respectful; (iii) Anthony Bate could have been specially bred to play Lacon, so naturally did he fit the persona of a senior civil servant; (iv) Stolichnaya vodka probably wasn’t that widely available at that time - I seem to remember it only became a popular brand in the UK later in the ’80s; (v) I felt bad for poor Bobchik the dog. I've watched Smiley's People a *lot* and I still don't totally have a handle on what's going on. The plot is very obtuse, and even though the time-line is more linear than Tinker Tailor Soldier Spy there are odd gaps in time that aren't clearly explained. I was left wondering how long did it take for the ‘Magician’ to visit Ostrakova after the General had received her letter, for example. You can probably infer a lot of these types of questions if you do an extremely close watch of the series, maybe take notes or something. Just thinking about it, I believe that Otto visits Ostrakova as soon as possible after The General calls Claus to get in touch with him. In this episode you see The General read the letter, and you sit with Mikhail while he tries to listen in on the call—you hear The General say he must get in touch with Otto, and that he has a package that he needs to send via Claus. Presumably he sent the package the next day and it took a week to arrive? Then Otto had to travel from Hamburg to Paris, and I can assume that he went straight to Ostrakova's apartment. I'd say that's a week to ten days gap. 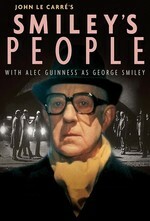 Unfortunately compared to the perfectly-cast Tinker, Tailor... there's a lot of dodgy accents and performances in this. Kirov barely matters since he's in it so briefly (and I quite like his badly-fitted suit, poor table manners and sweaty insincerity), but Villem is appalling and I really don't like Eileen Atkins' turn as Madame Ostrakova at all. Judi Dench was supposed to take the role, and I wish she had. I really like the irascible Strickland and the hapless Mostyn though. Makes you proud to be British. And reprimanding the young constable for saying "bloody hell" too! I did always wonder where they filmed the scene at the Soviet embassy in Paris. It looks fantastic and totally convincing. Also note that Ostrakova works for Baltic Imports (in Paris, natch) so, while rarer than today I'm sure it was back then, I bet that sort of thing would be available. Also, if you're going to have a specific set of operating rulse that involves the food and drink set up for the meeting, I bet you have that food and drink close to hand stashed away somewhere. I noticed this too, and connected it to Lacon's near immediate inquiry upon meeting George about how the local constabulary acted. Sure, he's good and polite and everything, but presumably the Ministry notified the local police to be on their best behavior and to treat the civilian pensioner sent their way with utmost respect. ahhh hahaha I love Lacon despite myself. I'd quite like to see Lacon going up against Sir Humphrey Appleby. Speaking of the weasel, what do you make of Lacon's attempt to enlist George's Marital Advisement Services? Is that gambit simply Lacon being a dolt and (willfully?) forgetting that George doesn't have the faintest about maintaining a happy marriage? Does he think George can tell him how to cope with his wife finding a lover? I'm inclined to think that Lacon just doesn't have anyone else to talk to about it, and he feels the need to vent to someone. Who better than master keeper of secrets George Smiley? Lacon's wife is a relatively large bit of fluff on the plot of Smiley's People, come to think of it. The only thing it does in service to the plot of the series is to set Lacon off to the sidelines—he's unnecessary to the proceedings and even getting in the way. From here on in he get's kept out of the loop. I agree that the chronology becomes clearer in later episodes. Also that Dudley Sutton did a good job depicting Kirov’s unpleasantness and awkwardness, though I’d be surprised the wobbly accent was a deliberate part of that. Also that Paul Herzberg as Villem is decidedly wooden. As to why Lacon chooses to buttonhole George re: marriage - it does seem odd, though when that discussion takes place (ep. 5?) there might be a clue in what Lacon says to George after their dinner. The thing about the almost implausibly helpful detective was reinforced for me, when, after re-watching Smiley’s People, I went back to Le Carré’s early Smiley stories Call for the Dead and A Murder of Quality (by way of their BBC radio dramatisations). The former sees Smiley teaming up with the implausibly helpful and eminently capable Inspector Mendel (later to feature in Tinker, Tailor…), while the latter has him befriend the upstanding and scarcely less implausibly helpful Inspector Rigby. Perhaps Le Carré just thinks highly of policemen? I loved how yellow chalk and missing ciggerettes led Smiley to his initial reaction, KARLA. Lacon warning him off. Stricklands thumbing his tumbler while balancing the phone line to Sir Saul. (my fav character actor in this opus) the Vodka in the safe house raised questions about acquisition. The more pertinent question is the ciggerettes, they were fresh and harder to obtain. The death of the generals dog "bob chek" or bobby disturbed me in the routine and brute nature like the generals to some degree but these hoods missed the trash in the generals pad. Sloppy work. Yeah, Lacon looks bereft in this one, trying to co-miserate with George. He uses that to through off Lacon. I think Lacon comes off the loser of that one.